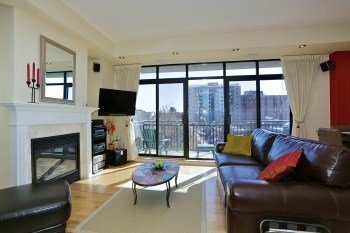 Enjoy the best of Ottawa’s urban lifestyle in this stunning sun-filled two-bedroom Condo at Metropolitan I built by Domicile. One of the most popular layouts in the building and rarely available, offering great open concept entertainment space separating the master and 2nd bedroom at opposite ends of the condo – perfect for the occasional guest or home office or both. Click Here to see the complete Photo Gallery or Click here to see the video on Youtube! Perfect for the empty nester who wants a comfortable oasis and be able to walk to everything imaginable. Being a corner unit with both East and Southern Exposure natural light floods the space. 1058 square feet of intelligently layed out space. Tasteful upgrades and design touches add to your comfort, including custom mantel, strategic pot lighting systems, surround sound speakers, custom closets, and slide out pantry shelving, beautiful glass paneled doors. Add to that beautiful granite kitchen counters, professional gas range, stainless steel appliances, cozy gas fireplace and the experience just gets better. The luxurious bathroom offers both a relaxing soaker tub and walk-in shower! High ceilings, extra large windows and a 17′ balcony brings the outdoors in and makes you feel part of the downtown pulse and lifestyle! Enjoy a glass of wine and BBQ overlooking the city. Washer and Dryer included with in-suite storage as well as storage locker and convenient covered parking are all part of the experience. Location doesn’t get any better than this. With a full grocery store just around the corner, you can enjoy fresh foods every day. Walk to the famous Rideau Canal, Shops, Cafe’s, Ottawa’s business section, the Byward Market, Parliament Hill, Museums, Theatre – it’s all here – leave the car parked and enjoy every minute. Don’t believe me – check out the walkscore rating of 98 out of 100 by Walkscore.com and take the little map tour and see what you’ll be enjoying. Click on the attachement below to view the flooplan. Call Eric Manherz today at 613-601-6404 for a private viewing!